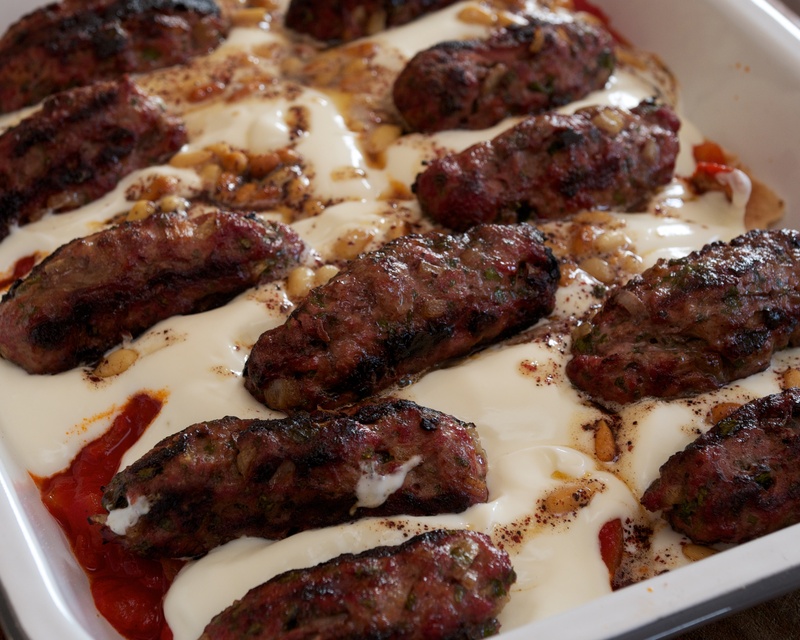 This Turkish kebab dish, from Claudia Roden’s wonderful book Arabesque, is very simple to make but you need to be organised and assemble the dish at the last minute so the layer of crunchy pitta bread at the bottom of the dish stays crisp. Claudia’s tips are to serve the tomato sauce and meat very hot but the yoghurt at room temperature. Start with the tomato sauce. Fry the onion in the oil until soft. Add the garlic and chilli pepper, and stir for a couple of minutes. Add the tomatoes, season with salt, pepper and sugar, and cook over a medium heat for 10 minutes until they soften. Open out the pitta breads, toast until crisp, then break into small pieces with your hands. Next make the kofte kebabs. Season the mince with salt and pepper, and use your hands to work into a soft dough. Add the onion and parsley and work into the meat. Shape into sausages, about 2cm thick and 7cm long. Arrange on an oiled sheet of foil on a baking sheet and cook for about 8 minutes under a pre-heated grill, turning once, until well browned but still pink and moist on the inside. Or if you prefer (as we do) you can grill on a barbecue. Spread the toasted pitta pieces over the bottom of your serving dish and sprinkle over a pinch of sumac. Pour the hot tomato sauce all over and top with a layer of yoghurt beaten with a fork. Heat the butter or oil with the pine nuts and stir in the teaspoon of sumac. When the butter or oil sizzles, sprinkle all over the yoghurt, arrange the meat on top and serve immediately.